Update your space from wall to wall by letting us install lovely, livable laminate. You’ll find whatever you want at our flooring store. We carry a wide variety, sizes, and colors of laminate flooring. Our goal is to give you want – stylish floors that showcase your unique sense of style. After all, you don’t want floors that look just like your neighbor’s. For laminate flooring that truly cater to your preferences, you can’t go wrong when you browse our showroom. Whether you want laminate that looks like hardwood or natural stone, you are sure to locate the perfect product right here. Because we are part of a large flooring conglomerate throughout Canada and the United States, we have access to thousands of products including luxury vinyl flooring options. So, if you can’t find what works for you at our store, we can get it for you. We also offer 12-18 months financing. One of the most unique aspects of laminate flooring is its ability to mimic other types of floors – from hardwood and ceramic to stone and porcelain. Due to the innovative manufacturing process, this type of flooring is made to look like any surface. However, it is incredibly durable. It doesn’t break; it resists scratches; and it’s not susceptible to moisture damage. We even carry laminate leather flooring that creates an exclusive look in your living areas. By choosing the right colors and styles, your new floors make your home interior the very epitome of style. 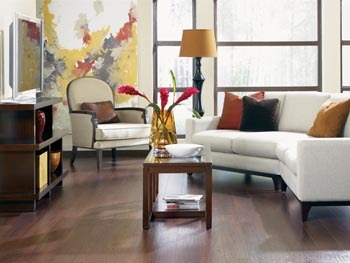 Give your home flair, and dare to install laminate leather floors. For more information, speak with our sales associate about the benefits of this unique product. Install your floor promptly and correctly by depending on our skilled laminate flooring installation specialists. By doing so, you ensure your new floor lasts for many years. From removing your old flooring and preparing the surface to installing your new laminate, we perform accurate services. Because we have installed laminate floors for many years, we use know the most efficient ways to ensure a job well done. Contact us for assistance in selecting a laminate floor product that is right for your project. We proudly serve customers throughout St. Paul, Bonnyville, Fork Lake, Lafond, and Elk Point, Alberta.